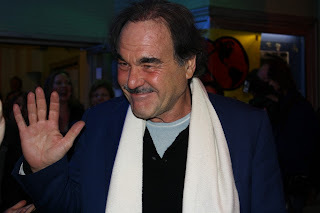 After the commotion of the Closing Night ceremony at the Boulder International Film Festival on Sunday night, Feb. 20, I managed to catch up with director Oliver Stone, recipient of BIFF’s first Masters of Cinema award, to ask him a few final questions about his impressions of Boulder and the film festival before he took off for a night of bar-hopping around town. The film festival marked the occasion for the third visit of Stone to Boulder. He recounted each of his three visits to Boulder, each with a very different purpose. In the ‘90s, Stone visited Boulder for the first time in the cause of vindicating Leonard Peltier, a Native American activist who was convicted for the aiding and abetting the murder of two federal agents. When here, Stone interviewed A-Man-In-A-Hood, an American Indian who testified on camera that he had been responsible for the murders for which Peltier had been convicted. Stone was brought to Boulder the next time in the early 2000s, this time to visit the Buddhist community at the Naropa Institute. And now BIFF. Awesome artical kaity....u should post a sound bite of the interveiw!